During a statement released from the Executive Mayor, Honourable Cllr. V.M. Motha, held on Friday, 26 January, to the Excelsior News, it was announced that an increase in outreaches were conducted by the Mayor during their financial year for 2016 and 2017. The Executive Mayor of Mkhondo focussed on basic service issues pertaining to the community of Mkhondo and it showed a major increase in outreaches and engagement with the community. Mkhondo Local Municipality awarded nine bursaries to full time students and financially supported thirteen learners with tuition fees. Through the Skills Development Office, 131 learnership courses were afforded to unemployed individuals through different programmes. It came under the municipality’s attention that some rural villages are struggling without the necessary electricity supply. In August 2016, Mkhondo Local Municipality installed electricity in a number of villages including Gadlanga, Driepan, Ngoweni, Nkukhunde and Ampie Farm, to name but a few. Mkhondo Local Municipality is mainly focussing on the future of the municipality and good progress has been made during the 2016/17 financial year. Mr R. Khubeka, Communications Manager, stated to the Excelsior News that there is much more to be done. Issues such as provision of water sanitation, the electrification of households and the enhancement of revenue will be focussed on in the new financial year. Furthermore, the construction project of a new cemetery, on the Emahlathini road, is well underway. Construction on the building of a road from Saul Mkhizeville to Iswepe is in progress and a main access road at Sandbank is also progressing. 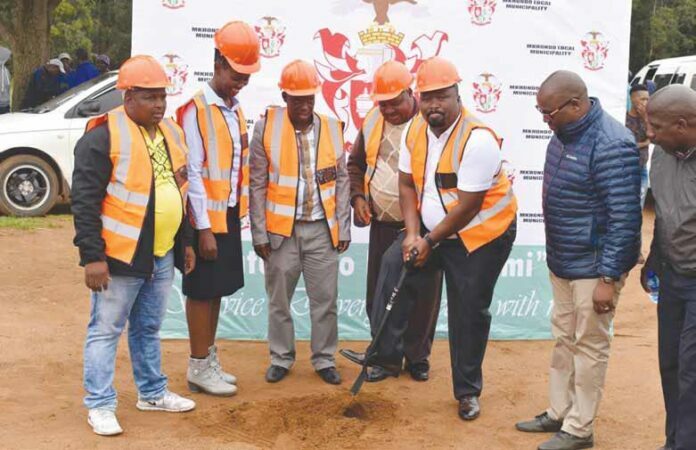 Mkhondo Local Municipality is also responsible for the construction of the Amsterdam Multi- Purpose Centre and the erection of basketball -, netball – and tennis courts, which also include ablution blocks, in Saul Mkhizeville. Currently, they are busy building the hawker stalls, at the corner of Zuidend and Church Streets. A fence was erected at the cemetery in Phola Park, under the municipality’s guidance and approval. Mkhondo Local Municipality managed to install three generator reservoirs in areas such as Rustplaas, Emaphepheni and Forest View. RDP housing in Mkhondo has been a major challenge in the past and the Mkhondo Local Municipality is in the process of constructing RDP houses in Ward 14, next to the R543 (Mahamba road). A total of 111 sites will be advertised for this project and published in the Excelsior News in due time. Over 200 RDP houses are already in construction. Access to fresh, clean water is also a problem for numerous citizens of villages surrounding Piet Retief and the municipality managed to install a bulk water line to Hartebeesfontein, Rustplaas, Emaphepheni and Forest View. A water project was completed to provide areas such as Eziphunzini with sufficient clean, running water. At this stage, the Executive Mayor managed to complete 65% of Phase One of the installation of the new smart pre-paid electricity meters in Mkhondo. This project secured job opportunities for at least 50 individuals. It helps to phase out the problem of illegal electrical connections throughout the area. Upon the Executive Mayor’s arrival in Mkhondo, only 40% of revenue from the community paying utility bills was received. It has risen to 75%. Furthermore, the launch of an LED (Local Economic Development) Forum is underway. The municipality is planning on creating it with a viable structure in which local business owners will be involved and which will contribute to the success of this initiative in ensuring the growth of Mkhondo. The Executive Mayor and staff at the Mkhondo Local Municipality would like to thank each proud resident and business owner of Mkhondo for their continuous involvement, financial support, job creation and payment of revenue towards the municipality. Thank you for joining hands and making Mkhondo stronger than ever!